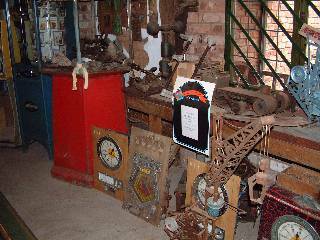 In 1990 the Bryans factory moved from London Road to smaller workshop premises in Packington Hill, and the original belt-driven machinery and other important artifacts from the London Road factory were taken to Drayton Manor Park. 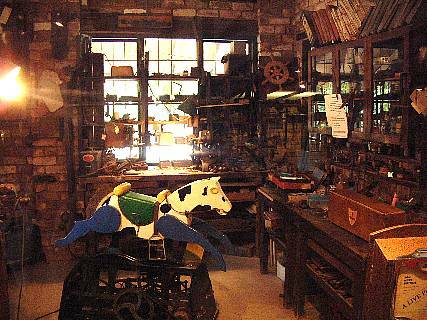 The Drayton Manor Family Theme Park in Tamworth is owned by the Bryans family (see footnote), and it was decided to set up a museum to preserve the history of the Bryans Works and exhibit some of the vintage machines for the public to play on. 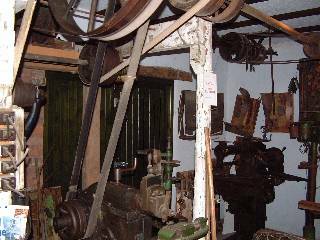 Inside the museum is a reconstruction of William Bryan's "Inventors Workshop", and also a large static display of the factory machinery and tools that were used to produce the machines. On the walls are many of the slot machines, which can be played by obtaining old pennies from the attendant (just like the old days!). 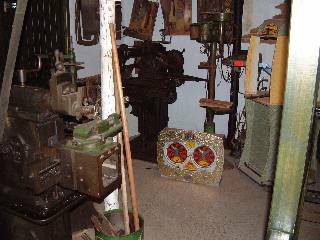 Other machines are displayed in various stages of restoration, and the walls are plastered with numerous photographs, sales leaflets, and other interesting paperwork. 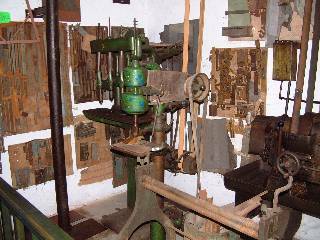 A selection of mechanisms is also on display. It's an Alladin's Cave for the Bryans enthusiast! 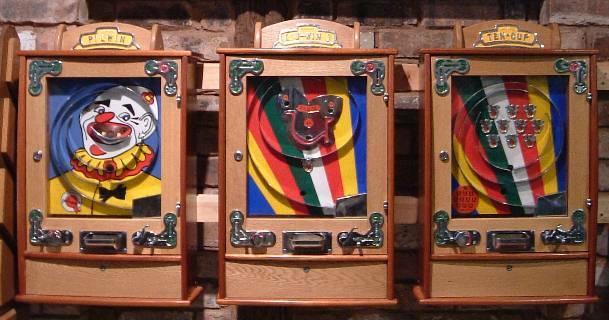 Three of the Allwins on display in the museum. Judging by the immaculate condition and matching two-tone cabinets, these were probably made in the 1980s or early 90s, and it is likely that they were made specifically by the Works for the museum. A visit to the Bryans Museum is highly recommended. Drayton Manor Family Theme Park is in Tamworth, Staffordshire (UK) and details can be obtained from their web site by clicking on the link. Bear in mind that it is a theme park and you will have to pay admission to the park and zoo, but you don't have to buy any ride tickets if you just want to visit the museum. The best idea is to buy ride tickets for the kids, and while they are off enjoying the rides, you can go and look around the museum! It is my experience that you should ring the park on the day of your visit to check that the museum will be open, and head straight for the museum as soon as you arrive. I have been a number of times and found it closed. At the time of writing this, the museum does not open at the start or end of the season, and sometimes closes early if the park is not very busy. Drayton Manor Theme Park dates back to 1949, when William Bryan's elder son George Bryan decided not to follow in his father's footsteps at the Works, but instead bought a group of derelict properties and surrounding land near Tamworth Staffordshire, with a view to turning it into a tourist attraction. During the first few years, the main entertainment was a boating lake and a few restaurants. A zoo was added in 1957, and the park is now a major theme park and visitor attraction. At the time of writing, Drayton Manor is still owned by George Bryan (83), with his son Colin as managing director. Colin is of course Willian Bryan's grandson. I believe it is Colin we have to thank for having the foresight to buy the artifacts from the original Bryans Works in 1990, and preserve them at the Drayton Manor museum. Update: George Bryan was awarded the OBE in 2004. He died in September 2013, and his wife, Vera, died the following month. "You may already know this, but there is a missing link in the story between the works in Kegworth and the acquisition of Drayton Manor. In 1931 a gentleman called Alfred Cartlidge developed a 70 acre site comprising a lake and surrounding woodland near the town of Wokingham in Berkshire, and created an amusement park which he called "California in England. This consisted of a ballroom, cafeteria, boating lake, Snake Train (the fore-runner of Drayton Manors), picnic pavilions, and an amusement arcade. 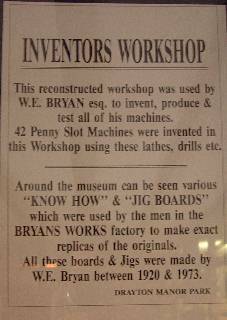 The arcade was equipped almost exclusively with Bryans machines, and Mr. Cartlidge developed a good working relationship with the company. Williams son George used to frequently visit the park to sell and deliver the latest machines, and on one occasion met and fell in love with Mr. Cartlidges daughter Vera. George and Vera married, and decided to set up their own amusement park nearer to the Bryans family base in the Midlands. Drayton Manor was born, and was modelled substantially on California in England. As I child in the 1950s I was taken to California in England on Sunday School outings, family picnics etc. and remember the wonderful arcade packed with Bryans machines. Through the 1960s the park fell into decline, and eventually became derelict. But the amusement arcade and its machines were mothballed. In 1970 I was given the opportunity to purchase the entire contents of the arcade, but, being a poorly-paid stage manager could only afford to buy one machine. Unfortunately the receiver took an all-or-nothing attitude to liquidating the arcade, and I left with nothing. Who bought the arcade I do not know."